TONY Magrathea is searching for a lawyer who will help him take on one of the biggest companies in the world. 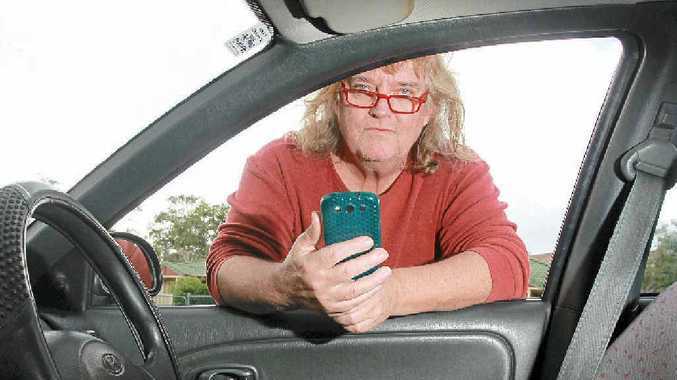 In a David and Goliath battle, the Dicky Beach man is seeking legal advice in his quest to sue Apple for the alleged theft of his idea which could help stop drivers texting while behind the wheel of a vehicle. The 57-year-old claims Apple stole his idea for both an ignition- and recording-linked device that would essentially "shut off" the texting and calls capability of a mobile phone. The prolific Daily letter writer believes the technology giant first spotted his idea through Facebook posts and letters to more than 100 news and political sources. He said he was motivated to put his ideas to paper when he read the case of a Maleny teenager who was charged over the death of a Taiwanese fruit picker she hit with her four-wheel drive. The then 18-year-old driver was using her mobile while driving when she hit and killed the man and seriously injured another. "I saw this story and just knew something had to be done to stop people being tempted to use their phone while driving," Mr Magrathea said. "People are addicted these days to using their phones. "This idea could be the answer," he said. In late April, Apple announced it would be seeking to address the dangerous trend of drivers using their phones while behind the wheel. Apple is now making a huge push into software for cars with its CarPlay system, which integrates an iPhone with a car's entertainment and communication tools, including connecting the car's navigation system using Apple's mapping app. Mr Magrathea said he was not afraid to take on the multinational, despite its size, reputation and deep pockets. He has already filed a legal complaint and contacted the company, with little response. He is now looking for a Sunshine Coast solicitor to help fight his case. He said his articles and letters and submissions to websites were proof the idea was already his. "I've published my idea long ago to 100 sites or more including the White House and United Nations. "Mobile communication devices just need a simple tweak to have the microphone listen for car engine noises or tyre-on-road noises, and when they are heard, the device turns off. "Noises of engines are entirely different inside a car to the noises outside the car, ditto for road tyre noises. "Simple to do, and it can be done in a simple upgrade of current system. All it needs is someone to say yes to the idea."